Thanks Jon, we appreciate the feedback. We don't actually receive that much feedback on Downloadcrew UpdateScanner. We're not even sure how many people are using it! I think you didn't explain the sorting issue. the Updates available should be shown 1st or in a separate tab for easy review. As for mismatches due to internal name issue. How about, using "file hashes" as identifiers? I don't know if its been done in others apps but it could be implemented with certain tweaking or testing. There are many types of hashes and they are quite unique and using a combination of meta-info and hashes, your accuracy would improve i think. Hope you give it a thought and all the best, will keep checking on the software, though i usually visit the site regularly enough anyway. The internal name has to be exactly matched, by name, to the product in our database. As an example, very occasionally a developer might even add the version number to the internal name and that changes every time they update their software, meaning we have to drop in the name in to the database. Massive logistical issues. 1) The meta name for their software should be plain and straightforward (such as "Ashampoo Burning Studio"
3) If there are separate 32-bit and 64-bit builds, this would be reflected in the relevant name. Taking the above as an example "Ashampoo Burning Studio 64bit", which would enable us to separate versions based on their meta data. 5) Very important: don't change the meta name of your product! 6) If you choose to use, say, "Google Chrome" for your internal name, don't use the same name for your beta and dev versions (although, bizarrely, Chrome Canary has it's own separate meta internal name)! Firefox builds have their own name, enabling us to match them up separately. We've got some more ideas for the Update Scanner. We've been busy with another project this week, but will be back developing it from next week. The developer has just informed me that, unless we get the version numbers matched in the DB to the product, it will not be matched correctly. For instance, if we add "17.1.0" to Comodo Dragon and the version internally is "17.1.0.0" ours will be flagged as newer. What a massive logistical quest this is! Love the product but the POP-Ad is too Much! I love this product and used it for a few days before I notices it added a POP-UP Ad. I'm testing this in small offices to help keep all software updated and the POP-Ad is too much. The conf room PC is always outdated so I added this update scanner it worked great until we were in a Conf and this Ad pop's up in front of everyone. Doesnt' look very good. I don't mind the Ad in program just don't POP-UP Ads or reminders please. Jeremy, there are no pop-up ads in the application at all. The Update Scanner only opens a single window and it doesn't use your web browser, so it's impossible that it can generate pop-up adverts. Pop-up adverts can only occur from you web browser, not from a Windows application. Can you send us a screengrab please? How to sort "Updates Available"? I scanned my PC, It said 145 scanned, Found updates for 25 and listed 112 as Unknown. Now on clicking the "Download them now" from App Store, i am taken to the website where all my Installed Applications are shown. Am i supposed to go through 145 apps to find out which one is up for updating? Also even common applications like, Adobe Shockwave player, Cyberduck, Filehippo, Freemake Audio Converter, Last.fm, GoogleTalk, GomPlayer, etc etc are getting listed with "from:UNKNOWN"
This "Downloadcrew UpdateScanner" is not ready for Beta, its has too much work to done. Thanks for the feedback. Let me address some of the issues you mention. We have to manually match the "internal name" (the meta name of the application) with our database. This isn't always easy, can change regularly and is often the same name used for the 32-bit and 64-bit version of an application. Take Freemake Audio Converter as an example. Just looked at our database and the internal name used to be "Freemake Audio Converter version 1.0.0". It's now "Freemake Audio Converter version". That's why it wasn't showing as supported, as the developer changed the internal name. We've updated the database and it should now be supported. Without feedback on unsupported applications - by reporting it as unsupported via Downloadcrew - there's no easy way of manually checking every internal name with the database. As I said, if the developer changes their internal name, the database link is lost. We rely on users to report this, but get few reports. 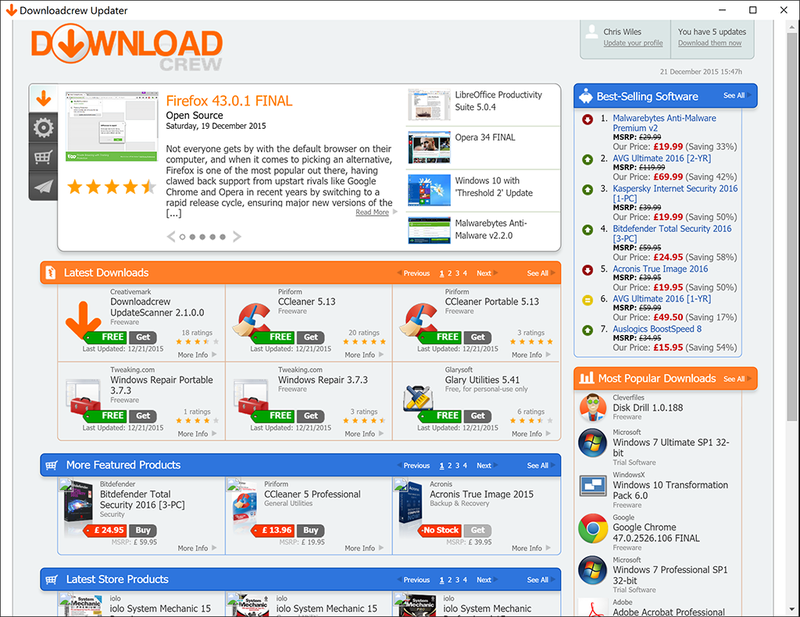 Applications such as Filehippo are, clearly, not supported by Downloadcrew as that's a rival application. We wouldn't expect our users to complain to Filehippo that they aren't supporting the Downloadcrew Update Scanner :) GOM Player has just been updated, Cyberduck should now be supported (again, another that changed their internal name), but GoogleTalk isn't even on Downloadcrew - we don't review everything. So, it's easy to comment there's much work to do, but we require users to report - via the website - unsupported applications, then we can either link up or add to a blacklist so you don't see them as unsupported. Not sure if you've noticed but the Filehippo checker doesn't support or list many applications. They add a lot of products to their blacklist.